Lately, people have been asking me about smoked cheeses, so this week on the Di Bruno blog, I devoted my column to Rogue River Smokey Blue from Oregon state. It's one of the best smoked cheeses on the market -- not that competition is stiff. Most "smoked" cheeses are loaded with Liquid Smoke, a chemical additive. For the 411 on why Rogue River Smokey Blue stands out, please check out my column. Full disclosure: I am a freelancer for Di Bruno Bros. Twice a month, I select a cheese and develop a post for their blog. This is how I cover the cost of my dairy habit. My friend Tracy, a.ka. 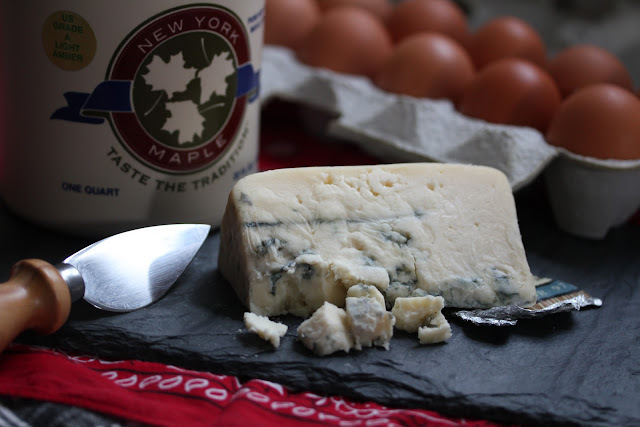 the Blue Cheese Goddess makes a holiday drink that has become legendary in dairy circles. It begins with a martini glass (don’t stop reading now!) dipped in lemon juice and brown sugar, then filled with a boozy Crème Anglaise concoction. Yes, it really does taste like Madame’s favorite scorched dessert, Crème Brulée. If you're looking for a naughty New Years Eve libation, may I recommend this extraordinary composition? The BCG inherited the recipe from her mother Elaine, who claims the recipe comes from the Ritz Carlton. On Christmas Eve, this drink overshadowed my cheese plate. I didn’t complain. It’s everything a person could want from the dairy case mixed with the liquor cabinet. Prepare to shiver. Rub the lemon wedge along rim of a martini glass, then roll the rim in brown sugar. Chill the glass. Pour vodka, Frangelico, orange liqueur, and crème anglaise into a shaker half filled with ice. Shake and strain into a glass. Serve with a smooch. Heat milk, sugar, and salt in top of a double boiler, stirring until the sugar dissolves. Stir a little milk mixture into the egg yolks, then add the eggs to the milk mixture. Set the mixture in the pan over barely simmering water. Cook, stirring until thickened, 3-4 minutes or until the mixture coats the spoon. Mix in the vanilla. Cool quickly by setting the pan in ice water and stirring briskly. Refrigerate until ready to use. 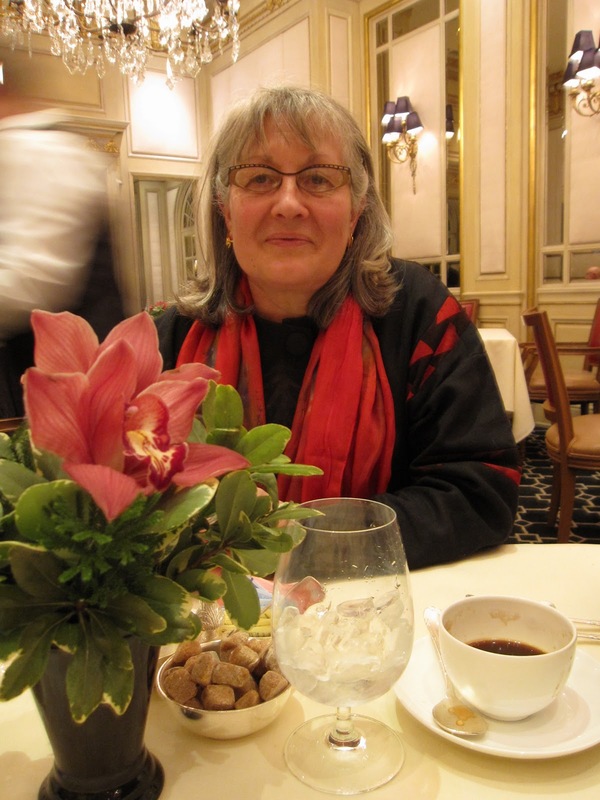 Everything I know about hostessing comes from my mother who was born in Geneva. To most, she was known as “The Frau” – she was a strict-as-nails German teacher in our midwestern hometown. To my brother and I, she was Julia Child crossed with Nancy Sinatra. She loved high boots, and she was always cooking. My brother André and I were her sous chefs. In the ‘70s, we whipped cream for her gourmet club tortonis; in the ‘80s, our mother discovered the Moosewood Cookbook and we became her renegade vegetable peelers. When our mother entertained, the house had to be spotless, the lighting perfect. André and I cued the right records, served drinks (usually in costume), and made sure all the teak furniture legs were feather dusted. Now that André and I are grown, we laugh at the hostessing traits we have inherited. Our mother taught us something beyond Swiss fastidiousness; she taught us how to stage domestic bliss, with all the right candles and details. Mother Fromage arrives tomorrow. You can imagine what I am doing right now. That’s right, putting a chocolate on her pillow. 2. Candles on the table always. Fresh flowers, too. Carnations are economical; they will last a month. 3. Leave chocolates on pillows, sparkling water by guest beds. 4. Never eat anything under bright lighting. Dimmers, people, dimmers! 5. Cook in the dark, or near darkness. It feels more sensual that way. 6. Plan surprise readings over dinner – poems by Emily Dickinson are fun to say, especially after a few glasses of wine. 7. Avoid the hair-pulling task of making pie crusts. 8. Swearing in the kitchen only, please. 9. Serve hot drinks in the afternoon when people get cranky. Make paper hats. 10. A cheese board for lunch means you don’t have to cook two big meals. My mother lives in Wisconsin where she is close to the dairy epicenter. My brother blogs at Andredarlington.com. As you can see, he inherited the Swiss upper lip and the widow's peak. Here we all are, two winters ago. Note the flowers, the lighting. In the dairy world, a cheese ball has about as much class as a Mr. Softee cone rolled in colored jimmies. And yet, who doesn’t salivate at thought? If the cupcake can make a comeback, why shouldn’t the cheese ball rise again? Over at Cheese and Champagne, my digital compatriots have thrown down a tauntlet. It’s called the Cheese Ball Invitational, and anyone with a blog can dip this challenge in peanuts and set the globe spinning. Let’s do it. Let’s make cheese balls. But let’s do it with intention. Let’s make cheese balls of integrity! This demands forethought. Before you resurrect a cheese ball, consider your audience – pick a worthy recipient, someone who has an appreciation for clashing boundaries. Then, embark on your mission. Make a serious face in the mirror and start inventing. Why not a cheese trapezoid? A fromage rhombus? For my minor opus, I present…the Point Reyes Pine Cone. Oh, yes, this is a cheese ball, but as you can see by its teardrop shape, this "gobbet of gunk" has arisen. Note how crushed gingersnaps in this recipe replace the salted-nut dermis. There’s room for interpretation here, too – as with all high art. Is it a pine cone, you might ask, or is it a forest creation by Andy Goldsworthy? To raise the cheese ball out of its puddle, I felt I needed to lob it at a person of quality. My friend the Blue Cheese Brit seemed like an ideal recipient for my re-branding campaign. As you can see, he’s wearing an ascot. This is not your average cheese ball consumer. Serve your guests some gin’n tonics, and the Point Reyes Pine Cone turns a stale party into beautiful havoc. Watch as guests bypass your beautiful cheese board to grab a crumb, a twig. The Point Reyes Pine Cone is the next generation cheese ball, friends. If we can’t save the planet, we can at least save the whipped dairy appetizer. Join me. Do it now. 1. Mix cream cheese, onion, blue cheese, fig, jam, toasted walnuts, and ground pepper in a medium-sized bowl. Stir until well-mixed. 2. 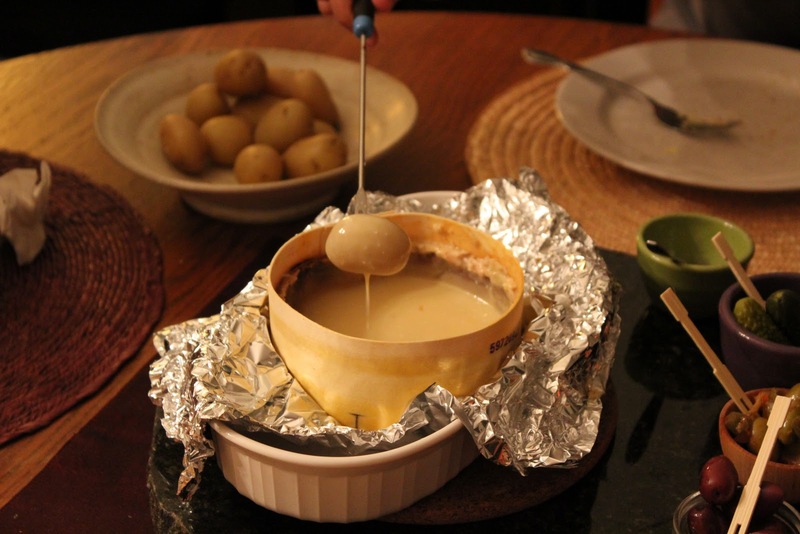 Pour the cheese mixture onto a large square of plastic wrap and form the glob into a ball. Refrigerate this little asteroid for an hour or more. 3. Use half of the ginger thins to make crumbs. You can use a food processor, or go old school: drop the cookies into a large Zip-loc and then use a wine bottle like a rolling pin. 4. When the naked cheese ball is cold, unwrap it and roll it in the gingernsnap crumbs. Use your hands to delicately mold the ball into a pinecone shap. Use the scalloped edges of the ginger thins to create bract scales. Serve with crackers and thinly sliced pumpernickel bread. Note: If you can't find Point Reyes, pick up a wedge of Maytag. It's a raw-milk cheese from Iowa, in the style of Roquefort. Point Reyes, from California, is ideal because of its sharp, salty kick, thanks to the seaside air that imbues the milk with a pleasant salinity. Maybe it’s Occupy Wall Street. Maybe it’s the number of people I know out of jobs. Or maybe I’m just developing a thick rind, but I can’t seem to force the holiday cheer this year. Do I need more egg nog? Have I become a morose middle-ager? Luckily, I can still get excited about cheese, cheese books, and cheese paraphernalia. Here are a few items I picked up in the last year that I just can’t live without. It’s the tea cosy for cheese lovers. The marble base keeps a weepy Brie nice’n cool, and the glass dome keeps flies and fingers away. This seasonal dairy rag keeps getting better – but I’m biased. 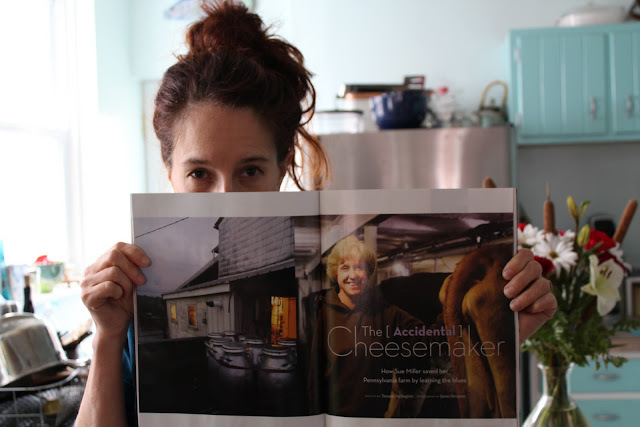 Great recipes, cheesemaker profiles, and news for the budding lactophile. So much better than scrambling around for butter knives. Max McCalman offers a casino-style approach to the wheeling cheese dealer. Each card features a lovely cheese photo with pairing info on the back. Flash cards? What a curious gem – I keep this on my nightstand and peruse the wild pairing suggestions whenever I can’t get out of bed. Inevitably, I’m cheered and refreshed. Nancy Silverton (of La Brea Bread) now kneads mozzarella for a living. Well, sort of. 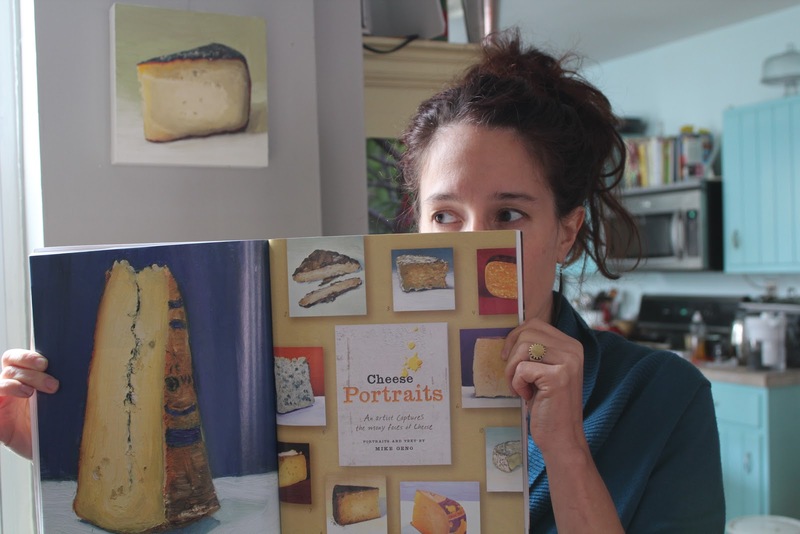 This is a brilliant book full of enticing cheese photos– I dream of making her squash blossom pizza. Hands down most-ogled book in our house. Think Morrocan fusion vegetarian with lots of Greek yogurt drizzled on things. From the Canadian wine writer François Chartier, a fascinating new approach to wine pairings based on his experiences with Ferran Adrià of El Bulli. The perfect tonic après cheesing. Put a few drops in sparkling water, and you’ll never need a soda again. Seriously good for digestion. I keep meaning to do a winter gift guide, but all I want to do is talk about Rush Creek. It is the meaning of Christmas, the star of David, the liquid heart of Santa – yes, yes, it is all of these things rolled into a cheese and bound with bark. 1. Rush Creek is made by Uplands Cheese in Wisconsin, the same folks who make Pleasant Ridge Reserve -- easily the most decorated cheese in America. 2. Cheesemaker Andy Hatch spent months perfecting this beauty. He uses unpasteurized milk so he had to develop a slow maturation process in order to legally sell these wheels (raw milk cheese must age 60 days or more). 3. If you’ve had Vacherin Mont d’Or, this is the U.S. equivalent – it’s made by hand using extraordinary milk from well-loved cows. 4. Rush Creek has the texture of unset pudding – its center is molten. You will want to spoon it into your lover’s mouth. Check out the New York Times photo. 5. Culture Magazine’s winter centerfold? Rush Creek. If you have a trusted cheesemonger, ask him or her to order this cheese for you. Prepare to spend about 30 bones, and don’t blanch at the thought. Andy Hatch has a baby, and he needs to earn a living. Cheesemaking is hard work – it requires milking cows twice a day, tending the land on which they graze, and then becoming trained in the art of hand-crafted cheese. When you eat Rush Creek, you are eating a little bit of Van Gogh. Alas, it’s here: the winter issue of Culture Magazine. It features my first story for the magazine, and I’m so pleased that it brings attention to a stellar blue-cheese maker from Pennsylvania, Sue Miller of Birchrun Hills Farm. I interviewed Sue this fall and spent a day watching her make Birchrun Blue. Her attention to detail and her deep love of all things Holstein showed me something important that goes into cheesemaking besides milk and rennet: devotion. Deep, deep devotion to animals, land, and the people Sue calls her "eaters". This issue of Culture feels like an album of greatest hits for me. The centerfold cheese is Rush Creek, from Uplands Cheese in my home state of Wisconsin. And the spread right after my story on Sue showcases Mike Geno’s cheese portraits (yup, that's one on the wall in the photo below). Mike’s been featured on this site many times. 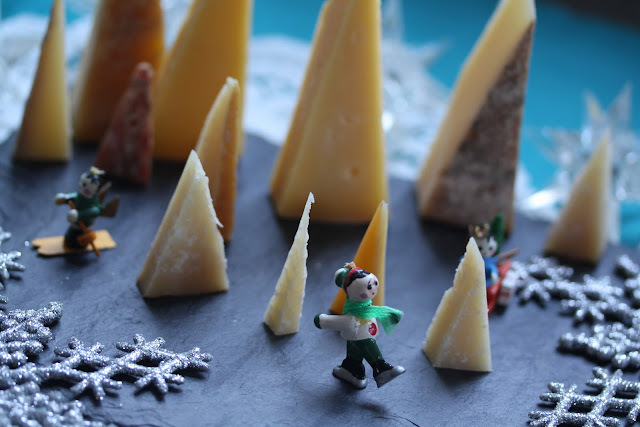 In fact, he often accompanies me on fromage junkets around the city. Birchrun Hills Farm Dinner: Coincidentally, Philadelphia’s own Southwark restaurant has planned to honor Sue Miller with a Birchrun Hills Farm tasting dinner on Wednesday, Dec. 21, at 7 p.m. ($45). Chef Nick Macri has four incredible courses planned to feature Birchrun's cheese, whey-fed pork, and veal. Please join Mike Geno, Sue Miller, and me. Raw milk and cookies for dessert! To reserve a spot at Southwark’s Birchrun Hills Dinner, call the restaurant at 215-238-1888. I’ve wanted to try Vacherin Mont d’Or ever since I first read Patricia Michelson’s description of it in her book, The Cheese Room. She calls it a "melting sensation" and compares the texture to “the folds of a satin peignoir.” Read: nightie. I was watching Mad Men at the time. I thought of Joan with her high, crimson hair and blousy bedroom attire. When I imagined the taste of Vacherin, I envisioned something voluptuous but repressed, delicate. Oh, how wrong I was. Vacherin is a tiger. It may, in fact, be the ultimate Mad Men-era cheese because it comes in a box, like an engagement ring, and it’s cinched at the waist with a belt (made of bark). When you bake it, it turns to Jell-O pudding. Vacherin is a seasonal cheese that hails from the mountain range between Switzerland and France. It’s ready in winter, and that’s because it’s only made with autumn milk when the cows come down from the Alps. The milk from these same cows -- in spring and summer -- is used to make Comté and Gruyere. Following Patricia Michelson’s instructions, I baked this cheese in its balsa wood box. At 350 degrees, it took thirty minutes. It’s important to wrap the box in foil in case the melted cheese leaks out. After the center warmed, I peeled back the top rind, swirled 2 tablespoons of Sauvignon Blanc into the custardy softness, and served hot Vacherin with boiled potatoes, pickled onions, and cornichons. Unforgettable. Imagine a forest melting in your mouth. A forest with nightgowns hanging like leaves from the branches. The taste is big -- mushrooms, sweet hay, night sweat -- and the texture is sumptuous. All you need is a salad with a vinegary dressing and a glass of Gewurztraminer. Online, you can find Vacherin at Murray's and Artisanal. I purchased mine at the counter of Di Bruno Bros. 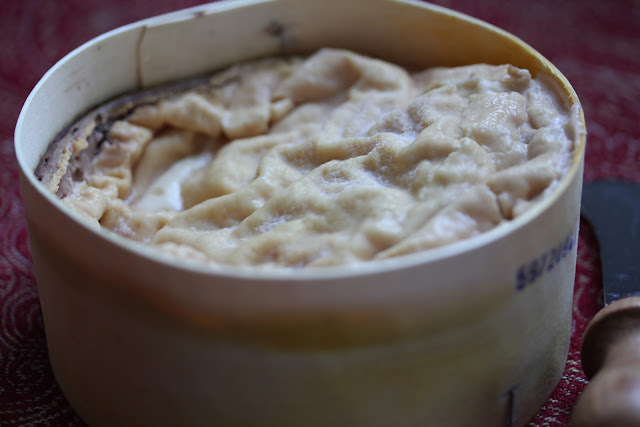 If you're lucky enough to find Rush Creek, a raw-milk version of Vacherin made by Uplands Cheese in Wisconsin, you could try this same recipe. This is a delightful supper for a winter Sunday. Change into your PJs as it bakes. I’m here to negotiate in favor of feta. If you bake it with honey and dates, you’ve got an easy appetizer, a succulent puff of briny softness, a winter warmer, if you will. I love an island of baked feta accompanied by dried fruit, a handful of walnuts, a sprig of thyme, and some homemade pita chips. To continue reading, please visit the DiBruno Blog.